Sometimes I change my mind about things. Here’s an example of one such time… sort of. I've never really found any benefit from the use of Index Cards in writing a play... until now. I always seemed to be hearing about people using them, with great success, to outline their stories. The great and the good would appear on their social media and announce how they are ‘just starting out on the index cards’ and express the subtextual view that a whopping great script would pretty soon emerge. I've tried to do this myself now and again. Not because my own odd way doesn’t work for me but because I felt I must be missing out on something useful in my life. I must confess I never really found the benefits. I always seem to end up staring blankly at a baker’s dozen of half-chewed cards, which I would eventually hurl at the wall and then shuffle back to scribbling maniacally. I written a blog post about this somewhere. Let’s face it, I’ve written a bloody blog post about most things at this stage. In fact here it is. That one states fairly clearly how I respect the ‘Index Card’ pre-planning process just how it’s really not for me. Reading it back again, I find I still agree with practically everything in it. But, this week, I have finally got the old Index Cards working very well for me. All because of something someone said at a Writing Thing that I went to a couple of weeks ago. Sometimes you might only take away the tiniest gem from one of these Writing Things but, as we know, tiny gems are pretty cool. In this case the tiny gem was this: The person giving the Thing said something, almost in passing, about how they don't use Index Cards to start a story, they use them to finish. So here I am with a new play, practically finished, but it's a complicated-enough thing. In among all the pages and pages there is a sense that it is all moving too linearly and also that something, somewhere, is missing. 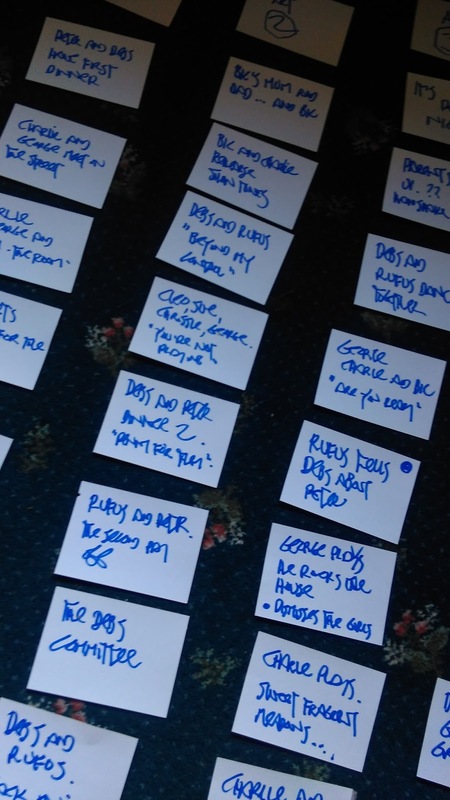 So, mindful of what the guy said, and in a last ditch attempt to find some kind of a working relationship with Index Cards, I've written each scene out on a postcard and laid them all out on the floor in order. Then stared at them for a while. And then changed that order. And then changed the order yet again. And, by golly, the story has gotten better. More sensible. Slightly more sophisticated in the telling. The Index Cards, they’re finally working! I just needed to use them at the end of the process. Not at the beginning. Purists may scoff and think gleefully about all the wasted words I’ve written to get to this place of relative order. If I had only 'Index Carded' it all out at first, the way would have been clearer and so much effort would not have been expended. A nice thought but not one I can use. Index Cards, nor any kind of preliminary planning, just don’t get me started. I need to plough in, get writing (often with a lot of dialogue) and a form tends to emerge from there. That’s what the earlier blog post was mostly about. We have to find our own way to do things lest we do nothing while trying to do things the ‘right way’. You're right: you have to use the things that work for you, in this case it's using things in the right order. If index cards have anything to teach writers, inanimate objects can do this on occasion, it's that there's always more than one direction to a story (and more than one way to get it down). Sounds like you've found a perfect device to help you rewrite.